A new study from a researcher at City, University of London has found that the location of lesions in the eye can help predict vision-threatening diabetic retinopathy, a frequent cause of blindness in the Western world. The paper, which is featured on the front page of the prestigious journal Diabetologica - a leading journal in diabetes research – shows that the location of early lesions is predictive of whether or not diabetics will later develop a vision-threatening condition. In the study, the researchers identified a map of the areas where the occurrence of the very first lesions is associated to an increased risk. This was made possibly due to the development of image analysis algorithms for the identification of reference points in the retina. 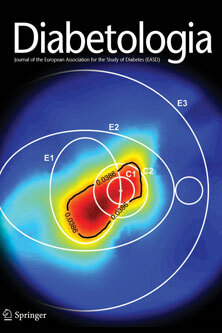 The map itself was also shown on the cover of the issue. The study has significant implications, as the research demonstrates that this evidence should be used to optimise screening programmes so that higher risk diabetics can be identified and public resources can be distributed accordingly. As with more efficient screening programmes, costs can be reduced and higher quality of care delivered. Dr Ometto’s current research at City is also looking into at measurement of the severity of a disease called Uveitis through the analysis of images taken with Optical Coherence Tomography (OCT) technology. Uveitis causes inflammation of the eye and is responsible of 15% of UK blindness. The disease affects people of working age, with destructive repercussion to their quality of life, but available treatments are toxic and current system for the grading of the disease severity is very subjective and generally poor. As a result, preliminary studies have suggested that the automatic analysis of non-invasive OCT images could replace the current, subjective system which could help guide treatment decisions, avoiding unnecessary, toxic treatments. At City, Dr Ometto aims to automatically detect the areas of interest in the OCT images, which will enable identification of the most reliable measurement based on these areas.